Frame the Blog Header Image. ~ The Blog Doctor. You are here: Home > Picture in Header > Frame the Blog Header Image. Frame the Blog Header Image. The Image you load in the Blog Header serves as a branding image for your blog. It is hence important that it should be loaded correctly and positioned properly at the top of your blog. Viewers will recall your blog better if you have a striking blog header image at the top. Recently many bloggers had complained about their header images shrinking. Blogger has introduced a fix which resizes every image after upload and centers it at the top of the blog. What you type in your blog or whatever you upload like images or videos comes to lie within the innemost CONTENT box. This box has a PADDING and a BORDER. Outside the box is the MARGIN area which separates it from the adjoining element. These are four boxes which are nested within each other. The innermost box contains the Image. To modify the header image you have to alter the code within the template. For this login at Blogger.com and click on 'Layout' link on Dashboard. The Page Elements subtab will open. Click on the Edit Html subtab of Template tab at the top. First backup template to PC by clicking the Download Full Template link on the Edit Html subtab. Now if any error occurs you can reload original template from backup. Change "1px" in the above line to "0px" and save the template. 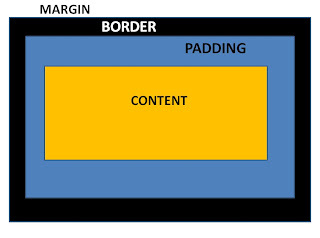 Note that the width line in the outer-wrapper and the header-wrapper has been increased from the original 660px to accomodate the increase in padding. The image has a 20px yellow border with a blackish background. The header has a black border. 15 VIEWERS CLICKED HERE TO COMMENT ON THIS POST. ADD YOUR COMMENT. Hey, I like your site so much I'd like to blogroll you; also, I've started adding avatars that are "blogs of note" and would like to add that too. Lemmeno if this is a problem. Nice post too, BTW! Got a ? I added a html widget to my header. The border goes around the original header and the html widget. How can I make the border go around the original header only and not around the html widget? Thanks. First delete the border round the header-wrapper and the header using same method as shown in above post. Another ? Is there a way to add an additional border inside the inner border that looks exactly like the inner border? Thanks. If you can add a div container anywhere you can put a border on it. Sorry, I don't understand. I assume you're talking about widget templates, but I've not dabbled with that part of the html yet. Will you explain further? Thanks. If you add a border line code to the #header-wrapper you get a border on that container in the web page. Yes. Thank you. I have done that. I was wondering if I could add another border inside that one, or make the border a double border. Instead of a full (wrap-around) 1 px border, I just want a single line (1 px) at the bottom of my header. How would I add a decorative, scrolly-type border around the header image, or something prettier than dotted, straight line, etc.? I'm assuming it would come from an image, but what would the css code look like for such a thing? The easiest method would be by adding it in an image editing program in the image itself and then uploading the new image to the header. Image editing programs like Gimp and Irfanview are free. Just Google for them.